Newspapers like the New York Times and Wall Street Journal are currently experimenting with paywalls that prevent non-paying customers from accessing some content. But what if all customers could access the same content, but the “economy” (i.e. free) visitors saw ads and other clutter while the “business class” customers got a cleaner experience? Would that be a viable model? 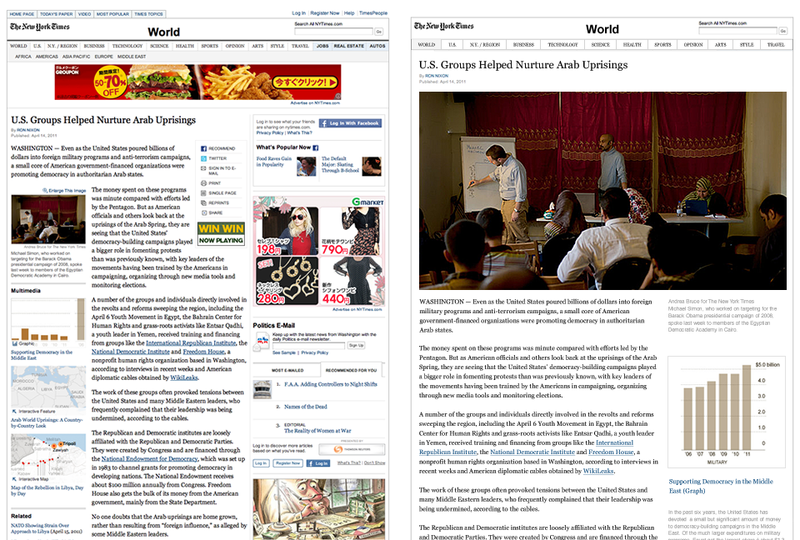 Oliver Reichenstein argues that it could be, and gives the example of the two pages below. Would you pay a premium to read the one on the right? What else could a publisher do to create premium experience for paying customers, other than restricting content?